This summer it’s all about being bold. Think about it, neon shoes, graphic and assymetric silhouettes and bright prints are all there to make the summer style bright as ever. While neon shoes can make a bright accent in your look mixing prints can be a completely different thing. You take one print and another print and then what? How does one make it look wearable, bold, but not flashy flashy? To pull off mixed prints wear them in colors of same color family. This will help you coordinate them better and keep the look bold yet not over-the-top. Start with neutral colors and then when you are more confident with mixing prints try brighter colors. Scale is very important when mixing prints. The mixed prints should be of same scale or size in order to look good together. Start with simpler prints like stripes and polka dot to get more comfortable with mixing prints then go for bolder and more complex prints. 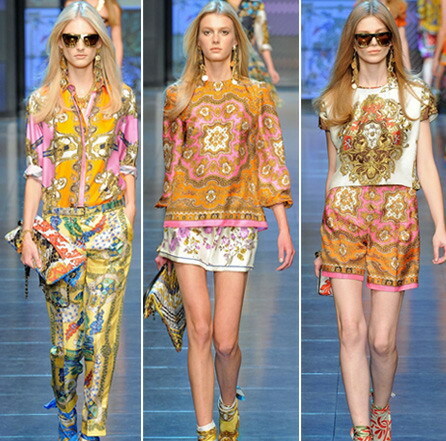 Dolce & Gabbana make a great example of mixing complex prints in an outfit. Black is a neutral and classic color but it doesn’t always work with bright prints as it looks too heavy and out of the color scheme. Choose wearing solid black only if your printed item is in dark colors or includes black. 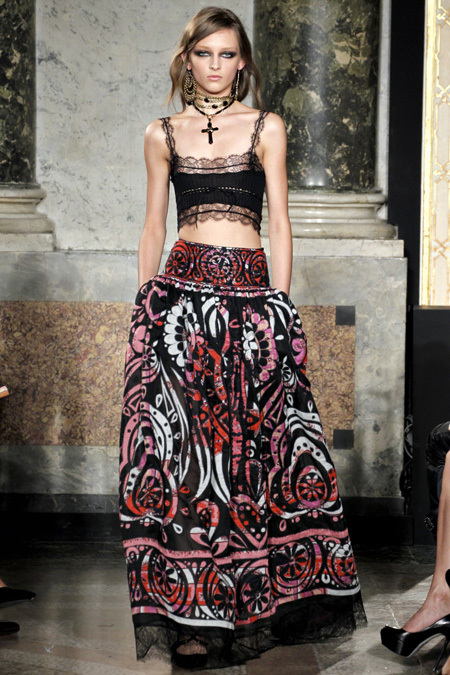 For instance, Emilio Pucci paired a black crop top with printed maxi skirt in black and red. Throw in a solid color into the ourfit when mixing up prints to make the look more wearable. 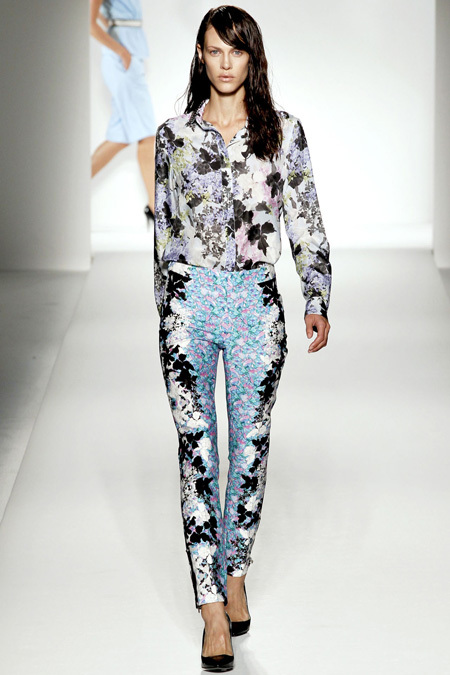 It can be a printed top and a solid blazer or vice versa, printed pants and printed top with solid blazer. Options are limitless. Ready-to-wear pieces in mixed prints save your the trouble of mixing prints up. 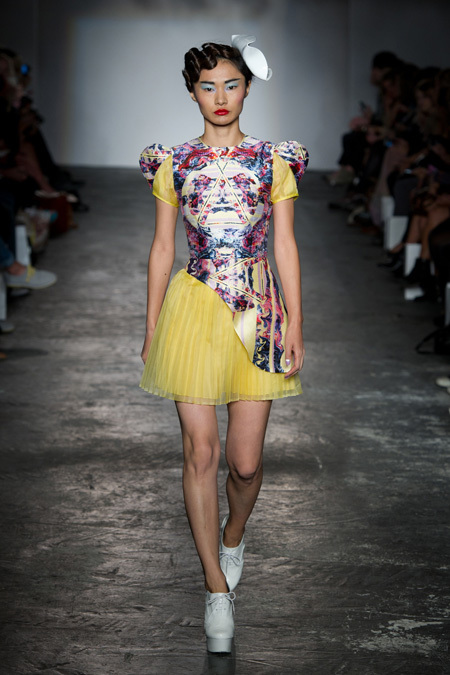 You just have to find a frock that fits well and accessorize. It’s best to choose solid colors for footwear and other accessories for such an outfit to balance it out just a bit. You can choose one color from the print and use it in shoes and bags or go neutral.